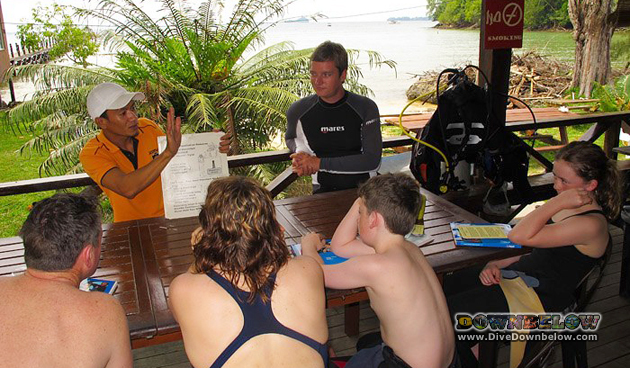 Downbelow hosted the Family Mitchel at our PADI 5 Star IDC Dive Centre on Gaya island in Kota Kinabalu recently, for a few days in paradise and, of course, to learning how to dive. Seasoned PADI Instructor Wellson took the lead in qualifying the Mitchel Family for discovering the other 70% of the planet, our ocean. Carefully watching to learn a few tip and tricks, was Luke, who is a professional scuba intern with Downbelow, taking part in our November IDC when he too will become a diving Instructor. Consisting of Ma and Pa Mitchell and the two kids, the Family Mitchel discovered that diving is for all ages and abilities and as long as you’re 10 years old and above, you can do the PADI Open Water Scuba Diver course. For those younger than 10 there is also the PADI Bubblemaker course, a brilliant way to get the little ones interested in diving from an early age. The family had a great time with us and we look forward to their return and continued exploration of the world down below.